This section summarizes the effect of the SGX Nifty on the Indian stock exchange, if any and talks about the trading hours and historical data. Nifty : Nifty is the benchmark index of the National Stock Exchange and is comprised of 50 of the largest companies listed on the NSE. When we combine them together, we get SGX Nifty which is nothing but the Indian CNX Nifty traded in the Singapore Stock Exchange, one of the leading stock exchanges in Asia. To be more specific, it is a derivative product (a future) and is quite a popular product of the Singapore Exchange. The SGX Nifty is an attractive product for investors who are not able to access the Indian markets but want to take up a position in the Indian sector. In doing so, they do not have to setup or register with the Indian authorities. Hedge funds who take up exposures in Indian markets are also finding it useful to hedge their exposures there. Since SGX is essentially Nifty futures trading on the Singapore stock exchange, it is not uncommon to consider its effects on the Indian markets and vice versa. The movement of the SGX Nifty is a very good starting point for the Indian stock exchange. This is possible primarily due to the trading hours. While the Indian CNX Nifty trades for six and a half hours on the NSE (9:15 a.m. – 3:30 p.m.), the SGX Nifty trades for 16 hours a day, from 6:30 a.m. to 11:30 p.m. IST. One can only imagine the magnitude of fluctuations and economic changes this could bring about. Due to its long hours of trading, it is affected by the world economic cycles and global political events. Professional traders and Investors find it extremely useful for their hedging requirements. The direction of the SGX Nifty is a guiding light for the Indian Investors. It can be inferred that if the SGX Nifty is 30 points positive then the Indian markets may open on a higher note. Same is true for the reverse case as well. Depending on SGX Nifty, intraday traders and smart traders can either take up long positions or short positions. This is an excellent head start to the day. 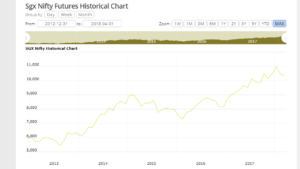 Below, you can see the historical data for the SGX Nifty Futures. If we compare the volatility of NSE Nifty and SGX Nifty, we will observe that the Singapore Nifty is much more volatile. The factors that influence its volatility have little to do with the factors that direct NSE Nifty. For future contracts, there are many aspects which are important to know. Some of them have been described below. Contract size = $2 (USD) * current price of Nifty Index futures price (SGX S&P CNX Nifty Index futures Price) which is approximately US$11,000 (assuming futures price of 5,500). The contracts which are available for trading can be divided into two kinds. They are Monthly and Quarterly contracts. Most of the volume of trades is concentrated in the Monthly contracts. Monthly Contracts are available for 2 nearest serial months. Quarterly contracts are March, June, September and December. Minimum price fluctuations: Minimum price movement of the futures contract is $1 which is equivalent to 0.5 index price movements. T session: 9:00 a.m. – 6:10 p.m.
T+1 session: 7:15 p.m. – 2:00 a.m. (following day). Last trading day: The last trading day is the last Thursday of the expiring contract month. In case it falls on an Indian holiday, the last trading day is the preceding business day. 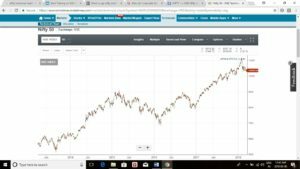 Settlement basis: The settlement is a cash settlement and final settlement price is the official closing price of the S&P CNX Nifty Index, rounded to the nearest two decimal places. This official price is derived based on the average weighted prices of the individual component stocks of the index during the last 30 minutes of trading. Position Limit: Any person cannot own or control more than 25,000 contracts net long or net short in all contracts months combined. Both India and Singapore are in the same continent, Asia. The margin at SGX product is lower than those of NSE. SGX Nifty offers a unique window to foreign investors to invest in Indian markets. All of the above points, coupled with the fact that SGX Nifty is traded for longer hours, make it a good derivative to watch out.